Not long ago, I extolled the virtues of REN’s Glycolactic Radiance Renewal Mask. I really love that product, but it is a bit of a treat now I’ve not got so much expendable cash. Luckily, I have found an amazing alternative for just one sixth of the price. Introducing Dirty Works Vitamin C Brightening Mask*! Whilst the texture and formulation of this are nothing like the REN mask, it gives a very similar brightening effect which is of course very welcome for my dull winter-ravaged skin. Vitamin C is the hero ingredient in here (obviously..) along with Kaolin clay to draw out impurities and absorb excess oil. It also contains superfruit Goji extract and pomegranate, both rich in antioxidants. The Dirty Works mask feels lush to apply – I do love a good, thick clay based mask! To use, you just need to apply a generous layer to dampened skin then leave for 5-10 minutes and wash away. They recommend spending some time massaging it into the skin – particuarly the T zone – before leaving to harden. I did try this the first time I used it but forgot to do so the second time and it didn’t make any difference to the end result so I wouldn’t say it’s essential. I prefer to remove masks of this type with a muslin cloth to make sure you get rid of all the bits, and this of course gives a bit of extra bonus exfoliation! Much like the more expensive REN mask, this left my skin feeling refreshed and looking smoother and brighter. The best part though, is that it only costs £4.99 for 100ml. That’s twice the quantity of the REN mask, and one sixth of the price. Given that they offer similar end results, it’s a bit of a no-brainer really, isn’t it? Whilst I’ll still definitely use the REN mask when I fancy something a bit more luxurious, this Dirty Works mask will definitely be my regular go-to. 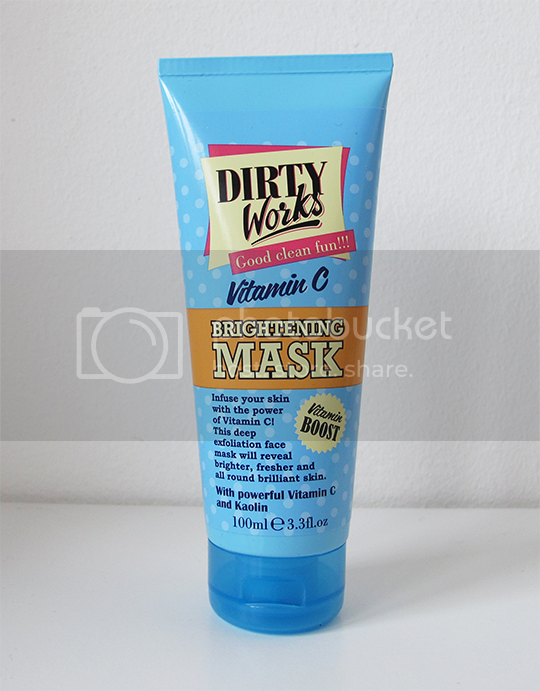 Dirty Works Vitamin C Brightening Mask is released on the 10th of March 2013 and will be available to pick up from leading Sainsbury’s stores nationwide. P.S. Just wanted to give you the heads up, I’ve had to remove the option to comment anonymously on my blog. I was getting upwards of 50 spam comments a day and it was doing my head in! Sorry about that! What a bargain, will need to pick this up!